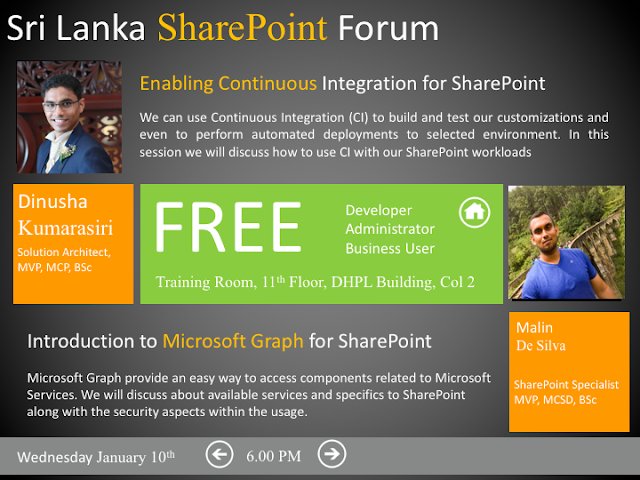 Monthly Meetup of the SharePoint Sri Lanka User Group for January 2018 was held at Microsoft Sri Lanka premises. I conducted a session on 'Introduction to Microsoft Graph for SharePoint'. The session covered the importance and the advantages of Microsoft Graph, authentication options and application of SharePoint related endpoints for the Microsoft Graph. The slide deck related to the session I did available below.